The next musical to take place in the Efteling Theater will be Pinnochio (Pinokkio), and Efteling are currently looking for 1,300 children to fill the roles. This is the 13th production by Efteling (including shows before the theater was built) and shows begin on September 20th. It has been a good few years since the theater produced a show solely based on a well-known classic story, the last one being Cinderella back in the 2007-2008 season. We have been taking lots of food photos, for research, naturally. I had never watched André Rieu perform before; all I knew was that he was a violinist, so this review is definitely from a non-biased standpoint! When I heard that he had done a show at Efteling however, of course I wanted to see it! 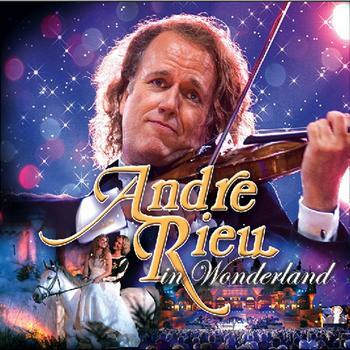 André Rieu in Wonderland was recorded at Efteling in 2007 in front of the Efteling Theatre. 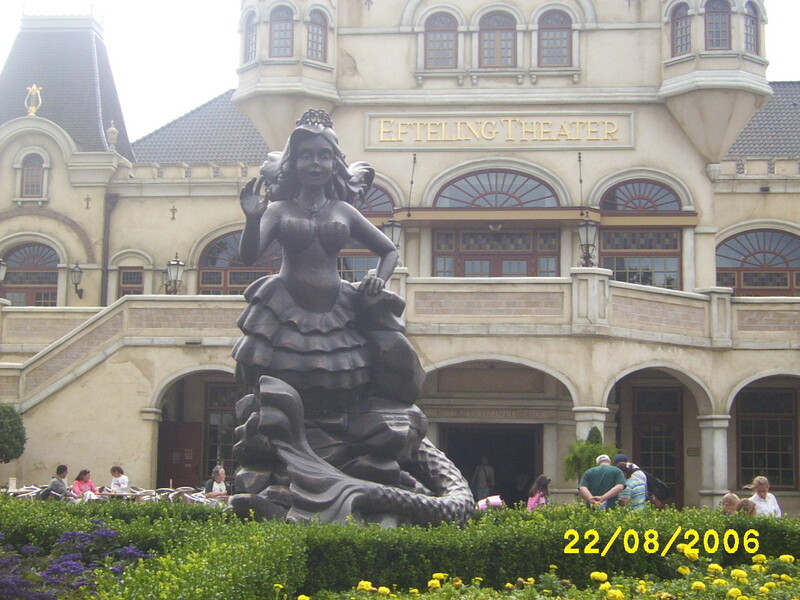 Anyone familiar with Efteling will notice a couple of different things about the Theatre when the show starts. Firstly, the signage on the Theatre usually says ‘Efteling Theatre’, but it now reads simply ‘Efteling’. Secondly, wasn’t there a huge planter full of flowers and a sculpture of a mermaid situated where the audience is sitting? Yes! Mr. Rieu kindly asked Efteling to uproot that so that they could fit the crowd in. The show starts off in dramatic style, until Rieu starts talking about princesses and elves! Then, seven elves chime in with their instruments, (playing Hi-Ho) who go by the name of the Quacking Quails. By this point, all misconceptions of a boring opera-style show have gone out of the window, because the show seems like it has had lashings of silliness injected into it already. 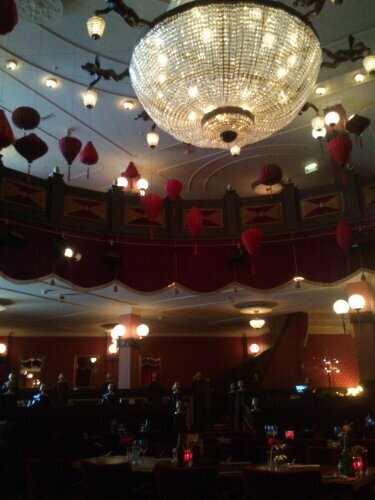 Before you know it, you are not at the Efteling Theatre anymore. A cacophony of bizarre characters, including fairies, Red Riding Hood, the Big Bad Wolf and André Rieu are all dancing around Anton Pieckplein to the tune of ‘Tulips from Amsterdam’. Next, we are taken inside of the Stoomcarrousel, which the band is riding, along with a few fairy tale characters, and the crowds from outside are seen dancing around the carousel (clog dancers, can-can dancers and many more!). If you have been reading Efteling UK for quite a while now, you may remember that Efteling have camels stored away for special events at the Fata Morgana. That’s right, camels! Of course it would be silly not to get your camels out for such an occasion, so for ’Salomé’, camels, belly dancers and even an elephant are used to turn the exterior of Fata Morgana into a living market place. This is also the setting for the frantic ‘Sabre Dance’. You will notice the fake floor that was laid down for this segment, which is understandable considering that some of the dancers throw knives at the ground! Then for something you really weren’t expecting…Magic gets involved; one of the orchestra is turned into a witch, another into a frog, and André Rieu is shrunk down to the size of Tom Thumb! This is all the work of singer Brian Dickerson from New York. He sings a couple of songs, including ‘I’ve Got Plenty of Nothing’ from Porgy and Bess. He’s pretty damned good! More magic is unleashed now, this time by Mr. Rieu, who turns one of the senior members of the audience into a beautiful young girl, who also has a beautiful voice! Turns out that she is an angel too! She is Mirusia Louwerse from Australia, and she performs two songs, the second of which takes place outside of the Little Match Girl building in the fairy tale forest, ‘Solveig’s Song’. We are given something a little more uplifting next from the Platin Tenors, who sing ‘The Impossible Dream’. The Platin Tenors are under contract with André Rieu, and are made up of Thomas Greuel, Bela Mavrak and Gary Benett. They are of course, amazing singers! This brings us to the intermission. The show is in 2 parts, of course, and at the start of the second part, we are welcomed back be some beautiful shots of the inside of Droomvlucht, set to the music of ‘Tara’s Theme’ from Gone With the Wind. Now here is a question for you: you have literally a boat-load of fairy tale characters, plus an orchestra, singers, and even more random and wacky characters with you on your evening at Efteling…what do you do with them? Why, put them on a swinging boat of course! The ones you can’t fit on get to sit beside it and drink lots of beer! Sounds like a good evening, especially when André Rieu is there playing ‘The Second Waltz’. More fairy tale goodness next, ‘Little Brother Dance With Me’ from Hansel and Gretel, which is, performed outside of Vrouw Holle’s house, Hansel and Gretel/The Witch’s house and in the Laaf Village. 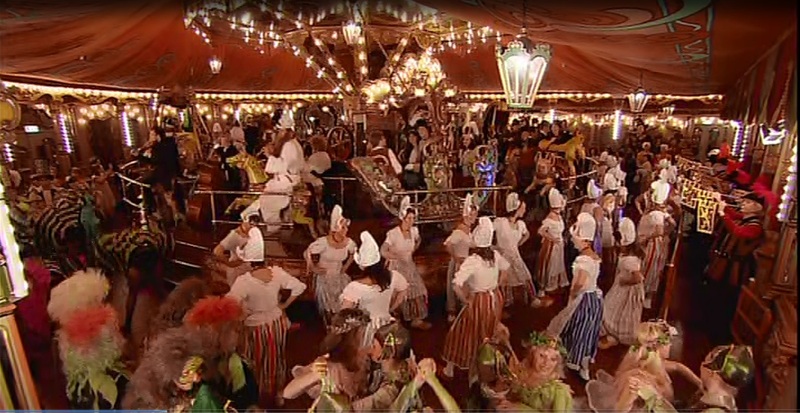 And now, the best part, in my opinion, of the whole show, André Rieu does Carnaval Festival! Apparently so does the audience, as they all start to get up and do a conga-line. Included in this number is bagpipe playing with the little Scottish man in the attraction, maraca shaking for Mexico, and ‘quacking’ for the frog orchestra in the ride…Although I do realise that frogs do not quack, but best not tell them that. It isn’t long before we are back to the more cultured side of the show, with Swan Lake performed on the Vonderplas by two amazing ballet dancers. It looks as though they are performing IN the water! Snow White had to get in there at some point, and next up is ‘Some Day My Prince Will Come’. However at the end of the number, the wicked witch chimes in trying to give one of the singers an apple, and unfortunately, for some reason, the audience tell her to eat it. How kind of them. Now, she lies in an open coffin outside of the Flying Dutchman, while her prince ballet-dances around her. You all know how this story ends though! ‘Somewhere Over the Rainbow’ is performed next, outside of the Chinese Nightingale building, making use of Efteling’s gardens and fountains with the added use of multi-coloured lights. Now for the finale! ‘What a Wonderful World’, performed by everybody. Of course it is a wonderful world, you are in Efteling! What could be better?! So then it was goodbye to the tulips and the mermaid! I had wondered why, on my last visit to Efteling, that the planter was gone. The production manager then shows us all the work that went into filming the Second Waltz on the Half Moon attraction, and then behind the scenes of the Tulips from Amsterdam segment. Apparently, this shows what all of the characters from Efteling do after closing time! There is also a lot of footage of the setting up of the show outside of the Theatre. We also learn about how the weather was very kind to the production, raining literally as they were finished filming, which was at midnight, as they were not allowed to wake the neighbours! The verdict? Go get a copy! It really is a lot more fun to watch that I thought it would be, especially if you love Efteling!